Just ask any couple. A romantic getaway can be a wonderful renewal of love, passion and connection. It can also be far less than what the couple intended.Almost everyone has memories of fun, frolic and togetherness from their favorite trip for two. And almost everyone also has not so fond memories of getaways with a love that just didn’t turn out as planned. 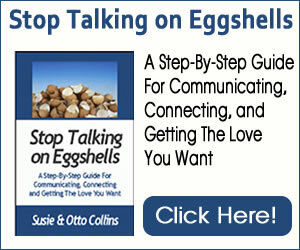 You can enhance intimacy, connection and passion as you and your partner getaway from your normal lives. All it takes is a willingness to be open, clear and present. Joanie thought she had it all figured out. She surprised her husband Paul with a week-long getaway for two at a scenic mountain cabin. In her planning Joanie included outings for hiking, kayaking, and plenty of “free” time at the cabin for passion. Unfortunately, when they arrived at the rustic cabin, Paul was disappointed to find no television and grumbled that he’d miss his favorite team in the playoff games that only happen once a year. The romantic getaway continued to go downhill from there as Joanie realized that Paul just doesn’t love spending endless hours in the great outdoors as she does. Though he thanked her for the surprise and certainly enjoyed the intimate times they spent together in the cabin, the countless bug bites, sprained ankle and sunburn that Paul endured did not make for an overly positive experience. Think through your surprise getaways with care. As Joanie found out, surprising your mate with a getaway may not be as perfect for him or her as it is for you. No matter how well you know your love, it could be that he or she just isn’t in the mood for what you’ve planned. And nothing is worse than spending time and money on a trip meant for you two to connect when only you are enjoying yourself– and even you may not be having fun. Try to step back from your first inclination when planning and ask yourself if your mate would truly like what you have in mind. Additionally, some people really don’t like surprises. There is a dimension of decisions being out of your control with a surprise like a getaway which can feel uncomfortable to some. For others, it is a treat to be surprised and to only be required to show and up and have relax. Be clear about your partner’s comfort level with surprises before proceeding in this way. Listen with openness and a sense of adventure. If Joanie had decided to share with Paul the getaway she had in mind during the planning phase, he may have said absolutely not or he may have been open to the rustic mountain cabin trip– but perhaps with some alterations. For example, they may have scheduled the trip so that the timing would better suit both of them. Even if there had been a television in the cabin, Paul wouldn’t have wanted to feel torn between watching the playoff games and spending time with Joanie so a different week could have made a difference. They may also have varied their activities on this getaway to allow both the chance to do what they thrive doing. If you are planning your getaway with your partner, listen with openness and a sense of adventure to what your love sees as an ideal and romantic experience. Be clear about what you’d like to do too. Now both of you have the opportunity to expand and perhaps be adventurous arranging for activities that you wouldn’t necessarily have chosen but are nonetheless willing to try out. There may also be more overlap in what you both want than you expected. Believe it or not, this openness and sense of adventure are key ingredients to your getaway being a more passionate experience. Be true to yourself and what you want, but stay open and you may find a deeper connection with your love. Let go of expectations and enjoy the moment. You’ve made reservations, set up transportation, perhaps you’ve even packed and are ready to go. Now is definitely the time to let go of your expectations for this getaway and just settle in and enjoy each moment that comes. Even if Joanie and Paul had planned their rustic mountain cabin trip together and found ways to include a balance of activities they both like to do, the sprained ankle, bug bites and sunburn might still have occurred. Stuff happens. When you can loosen up about what you planned and allow for the unexpected, you may find that you and your love can still connect and share passion– even amid the surprises and unpleasantries. It’s all about staying open and keeping your focus on what this trip was all about in the first place: to connect and celebrate the love you two share. Have fun and don’t forget to laugh as intimacy between you two grows!